Your location may have have different policies than listed here - please see your location page for specifics regarding your travel. Do you pickup or drop-off at the International Terminal at Hartsfield-Jackson Atlanta International Airport (ATL)? Yes, we are able to drop passengers off at the International Terminal in front of your airline. However, we are not allowed to pickup at the International terminal. You may take an Atlanta Airport shuttle that will connect to the domestic terminal and ground transportation area. After claiming your baggage at ATL Terminal North or Terminal South baggage claim, follow the signs toward Ground Transportation / MARTA. Exit the terminal through Door W1 or Door W2 and follow the covered walkway across the taxi pickup drive to the non-metro/shared ride area on the Green Row. Groome Transportation’s pickup is located on the Green Row in the non-metro/shared ride pickup area. Just follow the signs to the Green Row. We will pull into one of the spaces numbered 12-15. Groome shuttles to various locations share these spaces, so be sure to get on the correct van. We ask that passengers arrive 10-15 minutes prior to departure for both locations. International Travelers: We are not allowed to pick-up at the International Terminal. Locate the International Shuttle Connector which transports from the International Terminal to the Domestic. The ride is approximately ten minutes. Once at the Domestic terminal, you would locate our van at Ground Transportation in lanes 12-15. At the Colorado Springs Airport, we pick-up and drop off outside arrivals, level 1 in lane 2. FOR COLORADO SPRINGS: At the Denver International Airport we pick-up ONLY on the East Side of baggage claim. Passengers need to exit through door 505 and continue to Island 5 to meet their driver. At baggage claim carousel #8, take the elevator or escalator down to the tram level. Walk straight ahead about 100’ to the information booth and turn right. Then walk about 50’ and take the escalator or elevator up one level. Please check in at our desk even if you have a prepaid ticket, so we know you are there. Flight arriving at Terminal 2: Take the escalator/elevator UP one level from baggage claim towards Ground Transportation. Cross the skywalk and take the elevator down to Level 1. Wait in the shuttle area until your driver arrives. Departures from Terminal 2 are generally 10 minutes after the departure time from Terminal 1. If you prefer to make your way to Terminal 1 on your own, you may take the free light rail service. Terminal 2 light rail station is located on the north side of the Orange parking ramp. 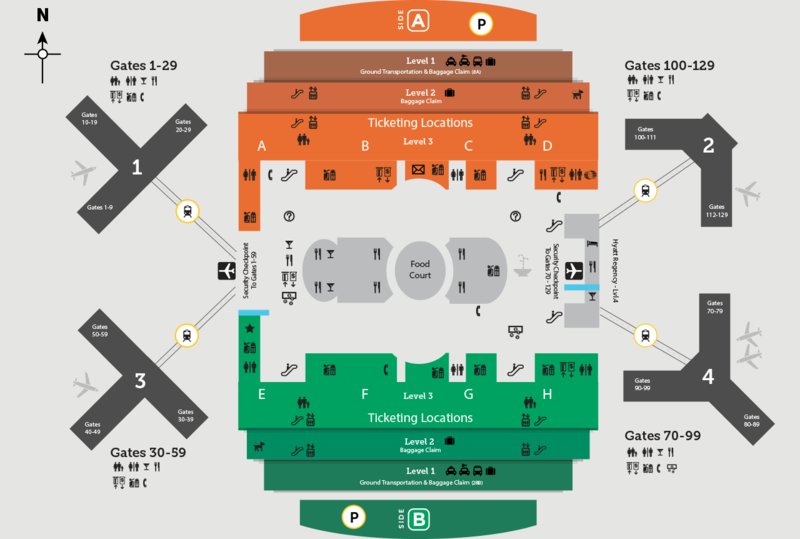 From Terminal 2, take the sky-way from level 2 across to the parking ramp. Follow the overhead signs through both parking ramps. Take the escalator or elevator down one level to the station platform. At the light rail drop-off point at Terminal 1, take the elevator or escalator up to the tram level. Get on the tram (free) and get off when it stops. Walk about 50’ to the information booth and turn left. Then walk about 50’ and take the escalator or elevator up one level. Please check in at our desk even if you have a prepaid ticket, so we know you are there. From the baggage claim area, take the elevator or the escalator down to the bottom level. Walk past the rental car counters and out the exit doors. Cross the crosswalk and enter the parking garage. Turn to the left. The Groome Transportation van picks up by the shuttle area. Orlando International Airport Pickup is available on both "A" and "B" side - Main Terminal. Level 1, (ONE LEVEL LOWER THAN BAGGAGE CLAIM ON THE GROUND LEVEL) spaces 14 & 15 . Orlando Sanford International Airport Pickup is across the street from Terminal "B" just past the taxicab loading area. Please wait under the canopy. Please contact your local branch to ensure adequate space, additional baggage fees may apply. We allow pets to ride in select locations with certain stipulations. Please check your Location's Page to be sure. Service Animals are always allowed on all Groome Transportation Shuttles. When pets are allowed on the shuttle: in order to avoid discomfort of any passengers, pets must be kept in a small (max size 2’x2′) airline-approved carrier. They must be clean, quiet and accustomed to travel. If they are not good travelers, we ask, for everyone’s comfort, that pets be sedated. Only one pet is allowed per vehicle, so please make reservations in advance. At Groome Transportation, many of our offices operate 24 hours a day, 365 days a year with limited service on Christmas Day. Please check your local branch's FAQ page for hours of operation.